Les temps des sucres (or sugaring season or Maple season in English) has finally arrived! Well, it officially started at the beginning of March but the season is running until the beginning of spring. It’s that time of year where you can put maple syrup on everything as much as you want without remorse or judgement from others! What is a Cabane à sucre & where to find them? This Quebec tradition dates back from the Native-Americans. 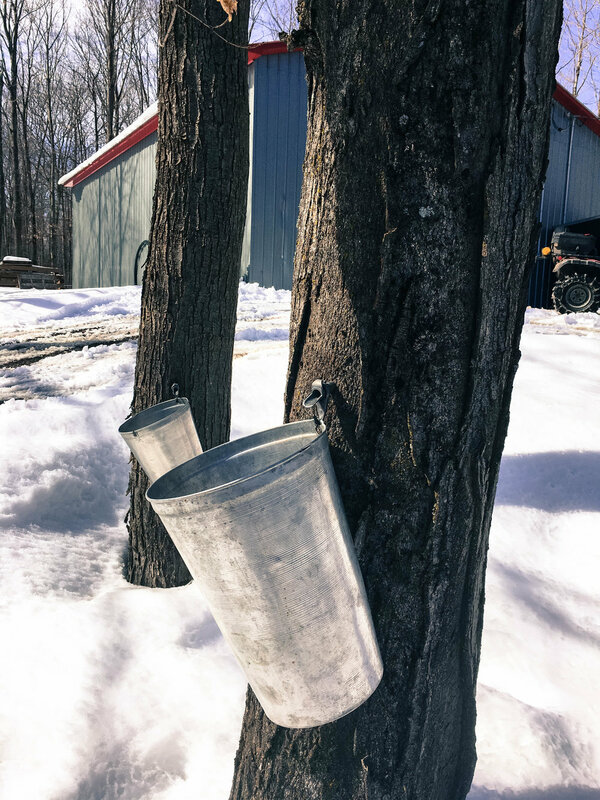 In the 19th century, the French settlers appropriated the tradition to tap maple trees for their sap, taking advantage of the natural phenomenon with the changing temperatures. Inside the sugar bushes or érablière, you find Cabane à sucre (aka sugar shacks) where you can enjoy the typical menu consisting of ham, bacon, sausages, baked beans, scrambled eggs, pork rinds and pancakes and sugar pie. Did I mention that you get to put tons of maple syrup on everything? The shacks sit big groups of people in long communal tables. The atmosphere is very joyful and familiar. You often have activities for the kids and you can stroll the forest to digest all the sugar. Quebec is full of érablières scattered through the province, after all, we supply the world about 80% of all the maple syrup. You can find them away from the big cities into the countryside. For the past 3 years, we have been filling our bellies at the érablière Shefford. 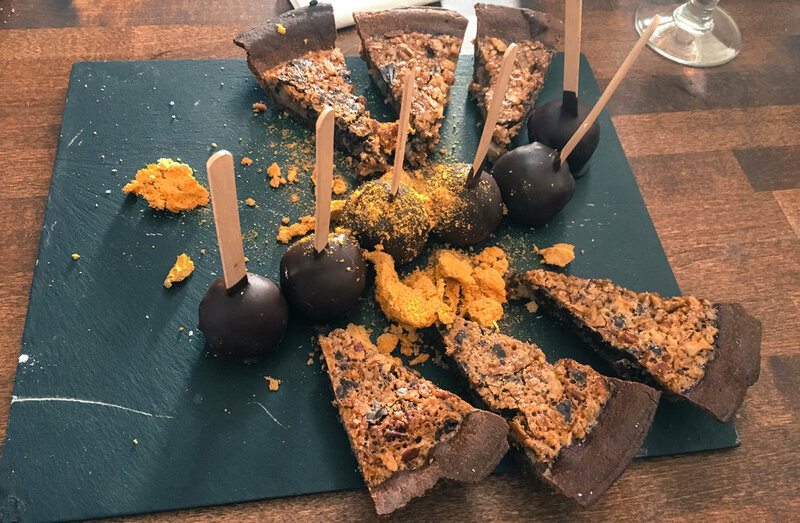 Located only 1-hour away from Montreal, in the eastern townships, this cabane à sucre has reinvented the traditional menu in favour of a more fancy & elaborated one. 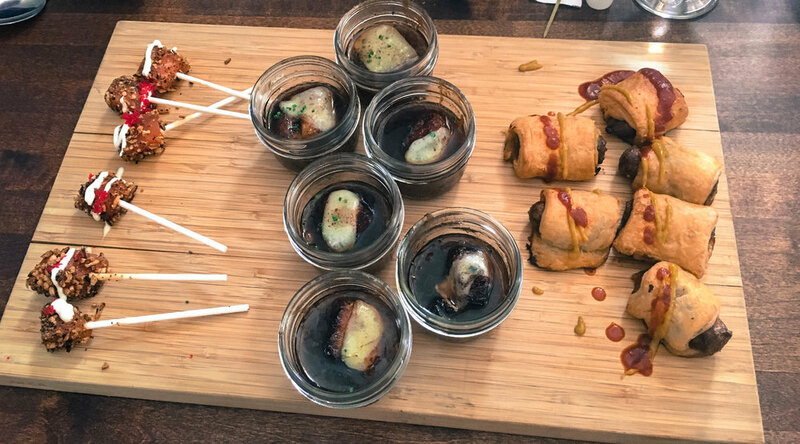 Every year, the menu and the chefs change giving a new twist every time we visit the shack. This year, Les Affamés, a well-known restaurant in Montreal, chose three big services with duck, pork, lamb & apple doughnuts. Don’t worry, the traditional tire d’érable (maple taffy on the snow) is still on the menu! The food was delicious! I almost fell into a food coma with so much sugar and fat. However, this year we were a bit disappointed with the very slow service and the drinks. The Cabane is a beautiful mix of traditional and modern decor. Wood log makes up most of the decor hinting the traditional construction methods of log sugar shacks. The long communal tables are separated by wooden pillars with the traditional metal bucket to collect the maple sap. Simple yet well decorated, the shack knows how to preserve its heritage while incorporating modern elements.